Hotel Un Patio al Sur | Direct reservations: Best price guaranteed. Be enchanted by this magnificent 18th century Andalusian home which is now a hotel in Seville. 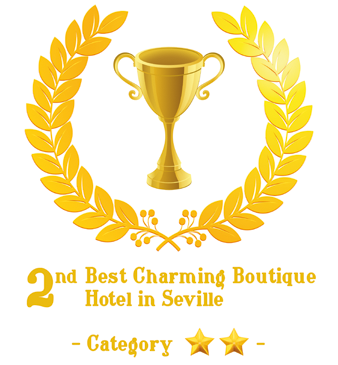 Our Seville hotel is in an authentic mansion which was formerly a convent until 1853. It has been completely renovated in 2008 in the purest local style and is now ready to welcome you in the very heart of the city centre of Seville. Hotel "Un Patio al Sur" will charm you with its privileged location, representative of the Sevillian way of life. With us, you avoid the overly touristy neighbourhoods, lacking authenticity and filled with souvenir shops. We welcome you to the heart of the city centre, only a few minutes walk from the main sites of interest in Seville: the Cathedral, the Alcazar, the Bullring, the pedestrian shopping streets and the famous "tapas" bars nearby. And only a few minutes walking distance from the hotel there guests will find a public car park open every day of the week. The charming streets of Barrio Santa Cruz.